Would you prefer an underwired nursing bra that is recommended by Midwife and lactation consultants? 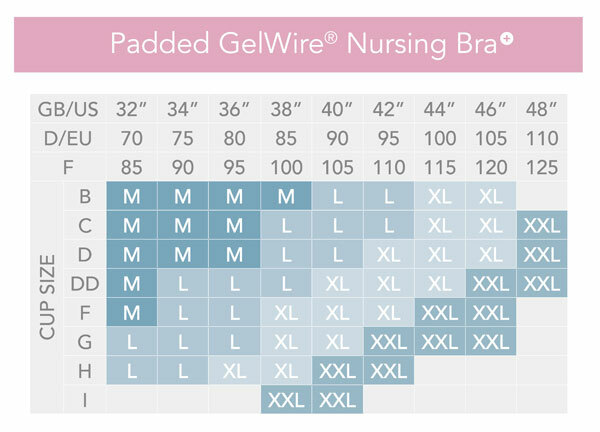 The superb Carriwell Padded GelWire® nursing bra may be the perfect choice for you! We think this bra is perfect for fuller breasts and curves and should give you really good support as well. Are you unsure which size of nursing bra to pick? Then this bra could be a really nice answer to getting the right size. Rather than picking, for example, 40D, you only need to choose either Medium, Large, Extra-Large or Extra-Extra Large (this bra does not exist in a small). How do you pick the right size? See the table below to find out which size you would be. As a single size (for example Extra-Large) covers several sizes, it means your bra should remain really comfortable as your size changes. How about the padding? It has light, removable moulded pads which should give you exceptional support and a beautiful shape. If you would prefer you can also choose this bra in black – see below for this option. What makes the bra so comfortable? Well it is also seamless – many of our nursing mothers love seamless nursing bras. How does it act as a nursing bra? Well, the cup design exposes as much of your breast as you are comfortable with – this maximizes skin-to-skin contact with your baby. So why do we think you should choose the Carriwell Padded Gelwire Support nursing bra? We think you will find it really comfortable, supportive and it should also give you a lovely shape.